"Pierre Vimont, France’s Ambassador to the United States, made his first official visit to Louisiana"
Pierre Vimont, France’s Ambassador to the United States, made his first official visit to Louisiana on February 21 and 22. In a meeting with Governor Bobby Jindal and many Francophone groups from throughout Louisiana, he stated that France has donated more than 20 million dollars to Louisiana since the storms of 2005. Representing Acadiana at the event were Bernard and Francoise de Reynies, Agnes Capello, Philippe Gustin, John Hernandez, III, Warren A. Perrin, Karel Roynette and Collin and Muriel Castille. 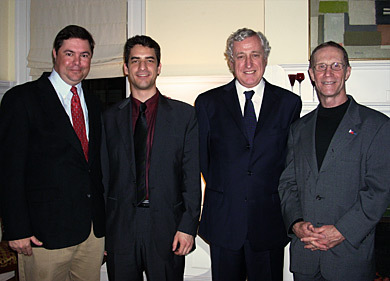 (L to R): John Hernandez, III, President of the Francophone Section of the Louisiana Bar, Karel Roynette, French attorney/intern, Pierre Vimont, French Ambassador to the United States and Warren A. Perrin, President of CODOFIL.